Prior to becoming an esthetician, I was probably what you would consider a “product junkie.” Trying a never-ending assortment of over the counter skincare products, hoping for results that were promised by the company. Not only did I end up disappointed, but often times these products came with a hefty price tag. After going through Esthetics school I felt almost jipped by these companies. They were lying to me and YOU, selling an unachievable outcome from their gunk in a tube. You see, what they have neglected to tell you, is the difference between OTC’s and Cosmeceuticals. 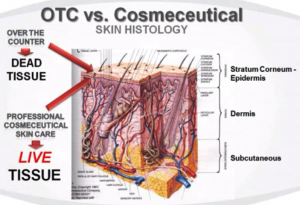 OTC’s do NOT have the same amount of active ingredients that cosmeceuticals have, they are not ALLOWED to. Cosmeceuticals are Pharmaceutical grade products that are only available through doctors and licensed estheticians. They contain higher amounts of active ingredients and penetrate deeper into the skin which is the dermis to be exact. Why are active ingredients important? They are ingredients that make changes in the skin. OTC products only work with the outer most layer of the skin, the skin you see when looking in the mirror, most of what you are looking at is DEAD SKIN. It will not penetrate any deeper. OTC products have so many fillers, parabens, dyes, fragrances, etc., and they are very watered down. Medical grade products work with the LIVE tissue in the dermis. The products at Skin perfect actually penetrate through the epidermis all the way to the dermis, where your collagen, elastin, and new skin cells reside. Our products work to rid unhealthy skin cells that cause pigmentation and uneven texture. They boost collagen and elastin production, and help speed up cell turnover. That is what makes HEALTHY SKIN. Please do not waste your money on OTC products as I have. Take this knowledge of skincare and ingredients with you. It will benefit not only your face, but your pocket too! With this knowledge it has become my mission to render Skin Perfect. As a part of Generation Y of course I thought that I knew everything. With the power of social networking and the unlimited access to the Internet I thought that I had all the information that I needed to look my best. Celebrities on my social networks told me what I was supposed to look like from makeup to wardrobe to accessorizing. Then YouTube gave me the “how to” on anything and everything I needed to do to achieve these looks from home. Naturally, on a college budget I was never able to completely achieve the full “celebrity” look. Soon after graduating college I moved back to Columbus and began working at Skin Perfect. That’s when everything changed! Over the last 10 months I have been able to create my own “celebrity” look. In the beginning of my journey I had my Color Analysis done. As a True Spring I no longer wear colors such as black, white or even silver jewelry, which I wore a lot of over the years, because those colors don’t compliment my undertones. During my service the makeup artist customized my foundation, lip gloss and lip sticks. They picked out some great eyeshadow and blush colors. As I began to embrace my color palette and wear it more, the compliments poured in. Now that I know that I look good in my color it allows me to be more confident even on my worse day. A few months later I built up the courage to get my first “tattoo” through permanent makeup on my eyebrows. Jaclyn is an absolute magician! It has reframed my face, and saved me time and money. The last part of my journey thus far has been changing my hair. With this newfound confidence I was able to take it one step further and embrace my natural hair texture and change my hair color. I give a lot of credit to the women at Skin Perfect. I love this spa and everything that they have brought to my life and the lives of our clients. I hope that everyone gets the same experience that I have had at this amazing place! Thank you ladies for making our clients and I your very own “celebrity” beauties!! The biggest mistake women make is not taking care of their skin. You should always wash your face and apply an appropriate moisturizer for your skin type on your face and don’t forget around your eye area. We age first around the eye area because the skin is like tissue paper. The skin repairs at night when you sleep so make sure you wash off your makeup. Your makeup is only going to look as good as your skin does. Before you apply your foundation you should apply a foundation primer to smooth and give your foundation staying power throughout the day. The primer will also smooth lines like spackle. 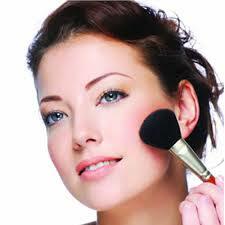 Be sure to apply concealer under eyes for dark circles and not use your foundation under your eyes. Apply an eye shadow base to your eye lids before applying eye shadow to ensure your eye shadow stays on and doesn’t crease. When you apply your mascara and get mascara on your eye shadow your should always wait for it to dry and clean it up with a cotton swab. This will prevent a black smudge of mascara on your eye shadow. Remember to always take care of your skin first and have fun with your makeup. I love to express my artistic skills through color and makeup everyday. A little blush and lipstick go a long way to brighten your face as well. Don’t be afraid to try. Practice makes… SKIN PERFECT! As an Esthetician, my face is a direct reflection of my work. Luckily, I have always had pretty good skin, but good skin or not, there are still many factors that can lead even the best looking skin to looking not so great. One of those factors is sleep, or lack thereof. Unfortunately for me, I’m a night owl. I say unfortunately because as a mom of three little boys and the wife of a construction worker (they start their days early! ), my little morning birds have me up before the sun is in the sky, which always has me asking myself why I stayed up so late the night before. The mirror is always a harsh reminder of why it was a bad a idea as well. That’s right, my skin is left to pay the price; rashy complexion, dark circles, puffy eyes, fine lines, etc. A lack of sleep can cut into the crucial restorative process that our skin goes through at night, such as collagen production, cell renewal, and lymph drainage (hence the puffy eyes) just to name a few. If your skin is cut short from this crucial process, it shows. When skin benefits from enough sleep, products & treatments work more effectively to provide better results. On that note, while it’s extremely important to get a good nights sleep, it’s just as important to NOT SLEEP IN YOUR MAKEUP. If you fall asleep in your makeup, your skin will skip the restorative process as it is busy trying to cleanse itself of the makeup and debris that was left on its surface, and it can’t rejuvenate itself. That’s why I always say, “If it was a crime to not wash your face, in the morning it would be a little misdemeanor, but at night it would be a felony.” Your esthetician recommends products for you to use specifically during your night routine, such as retinols or peptides, for example. The reason for that is because they work synergistically with your skin’s nightly renewal process, giving you optimal results. Missing a night here or there won’t effect your skin permanently. That’s a good thing, because trust me, we’ve all been there. However, skipping cleansing and not getting enough sleep at night habitually will effect your skin drastically, aging you prematurely. It is so extremely important, to the cellular level, literally, to cleanse your face, use your nightly products, and get a good night’s rest. After all, it’s not called “beauty sleep” for no reason! First of all, I’m so grateful and blessed to be with Skin Perfect now for over 5 years! My passion, curiosity and knowledge in the skin field keeps increasing, and with that I would like to address a very important subject – neck, chest and décolleté skin. I have observed that over the years our clients’ skin improves so much with our customized home skin care and individually personalized monthly treatments. Staying consistent is one of the keys toward desirable results, but Anti-Aging skin care and skin treatments shouldn’t stop at your face! I have noticed that there is a big tendency to neglect neck and chest more than the face! After a few years of improving only your face, your neck, chest and décolleté skin will start showing all the signs of aging. That does a huge disservice in having a healthy looking skin altogether. The skin on the neck and chest is thin, so sun damage is more apparent and harder to repair. Both the neck and chest require stronger formulations to reverse aging! The cut of your clothing often exposes your neck and chest to the sun, allowing for premature aging. We learned that just like the skin on your face, your neck, chest, and décolleté all require monthly skin cell exfoliation treatments to allow it to look younger and at its healthiest. Most of the time you’ll be able to treat your aging skin signs below the face with the same facial product, but since we do treat many specific skin concerns here at Skin Perfect we do recommend to ask your esthetician to personalize your neck, chest and décolleté regimen. At Skin Perfect we take a great pride in our ability to customize treatments to fit any specific needs of the skin, and now we can add your neck, chest and décolleté monthly treatments to your memberships! I am very excited about this addition since the sun-reverse season begins now! Lets erase unwanted aging signs with a progressive approach! Lately I have been noticing clients’ hands. Most likely because of the beautiful colors of nail polish I see in the summer while doing hand and arm messages during treatments. We protect our faces, and hopefully my clients also protect their neck and chest, but our poor hands are the afterthought of skin care. They really do show our age and all because no matter where you live they are exposed year round. Driving gloves and white day gloves were a spectacular idea, and how I wish they were still in style! So while you will probably not pull out the pair of white gloves your grandmother or great grandmother wore and try to bring back an old trend there is something you can do. First, as always in skin care – prevention, prevention, prevention! If you don’t break it we don’t have to fix it. So put your sunscreen on your hands all year and all day. It isn’t as hard as you might think. Place a travel size liquid sunscreen in your purse and use it as moisturizer. If you don’t like the liquid version, Skin Perfect carries brush on minerals in a retractable brush. It is wonderful for face neck chest and back of hands. Keep it in your purse, your golf bag, your tennis bag. Already have damage? It isn’t too late. 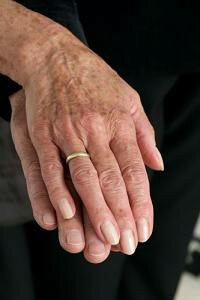 The backs of hands can be treated in the treatment room and at home with treatment products. Skin Perfect will customize an easy home care regimen and treatments according to your skin’s needs. Ask your esthetician in your next treatment or schedule an appointment. Growing up, all through high school, you were not cool if you did not go tanning in a tanning bed and have that beautiful vacation glow! My, how times have changed! Did you know the FDA cited an American Academy of Dermatology statistics that document a 75% increase in melanoma risk among tanning bed users, and the risk increases with each use? With the trends turning more to knowing and understanding preventative care, sun damage is one of the top trending discussions. I believe it is important to educate not only anti-aging clients but teenagers and young adults on the harmful effects of sun exposure and how to take appropriate measures on preventing sun damage and decreasing chances of skin cancer. A large part of the battle is to embrace your heritage and your own unique skin tone. Being as I am a very fair skinned, blue eyed, blonde haired female, I struggled to keep up with the naturally tanned, darker skinned women. At Skin Perfect, we place an emphasis on education and teaching the client how to feel and look their best in a positive way. Personally, color analysis changed my outlook on feeling the need to always be tan. I learned that based on my individual skin tone, there is a specific family of colors that looks best on me. Now when I wear the colors that compliment my skin tone, I feel more beautiful than I ever did simply being tan. Now, if I want to have that beautiful vacation glow, I use St. Tropez sunless tanner to look and feel sun kissed without the harmful effects of UV rays.